The term ”supply chain” may sound complex, but it just means a system that allows a manufactured product to reach a consumer in one or more steps. A typical supply chain network for a product will consist of a raw materials supplier, a manufacturer, a distributor, a retailer, and a consumer. Depending on who you are and where you are in the chain, you will mostly likely have an upstream (your suppliers, which could be production lines or simply the people you purchase from) and a downstream (your consumers, who are the people you sell to or your disposal mechanisms). 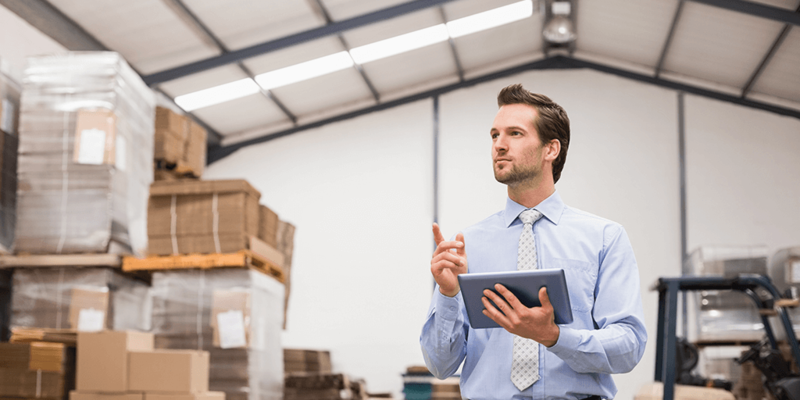 Back Ordering: Placing a purchase order to a supplier for a product that’s temporarily out of stock in your warehouse and has already been ordered by your customers. Back ordering is usually adopted during times of high demand and for slow-moving products that suddenly see a spike in demand. Bill of Lading: A shipping document showing the type of goods, their quantity, and the destination address. It is required whenever goods are transported from one point to another, whether you ship them by land, sea or air. This document also acts as a legal receipt of payment and has to be signed by all parties who are involved in the shipment: the seller/shipper, the carrier, and the buyer/receiver (when the goods reach them). Blanket Order: A method in which the buyer will agree to buy a certain quantity of one or more items over an agreed-upon period of time (which can range from a few days to several months) without specifying their exact shipment dates at the time of purchase. The vendor can ship the goods in parts and on any convenient dates within this period. This is usually done when the buyer expects an increase in demand for certain products and would like to get a discount for making a larger purchase without locking up all of their capital. Bonded Warehouse: A location managed by the customs office or a government body, where you may store taxable goods and imports subject to duties for business purposes. You only need to pay taxes at the time of removing the goods from the warehouse. This is particularly useful for retailers who import a lot of goods into the country, since it allows them to spread out their tax burden by deferring some tax payments to a later time. Carnet: A legal document that will allow you to temporarily export items to another country and then reimport them back into the US within a year without paying import duties. This document is accepted in more than 80 countries and covers most items except consumables (such as food, oils, etc. ), agricultural products, mail, explosives and disposables (anything that will be discarded following an export and will not be imported back). Consignment: This term has more than one meaning. Most often it means the act of placing your goods in the care of a third-party warehouse owner (known as the consignee) who maintains them for a fee. In addition to storing the goods, the consignee may sell or ship them to customers on your behalf for a fee. As a separate meaning, consignments can also refer to individual shipments made to the consignee. Cross docking: A method by which a business owner can ship goods that they have received from vendors to their customers with little to no storage time. This method typically uses a single dock or a platform that has the best access to both cargo loading and unloading areas, so that the goods unloaded from one set of truck can be reviewed, sorted, split into groups based on different destinations, and then loaded into another set of trucks for delivery. This method is typically used for perishable goods with a short shelf life and goods that are affected by temperature. Drop shipment: A situation where one of your vendors ships goods directly to your customers, on your behalf. Here, the customer will not know your vendor and will be making all payments to you, while you will be paying your vendor and still making a profit. This is useful for selling slow-moving items with a long product life, without bearing the burden of storage and maintenance yourself. EDI: Electronic Data Interface is a method of transferring transactions from one computer system to another, by converting the data into a standard that can be easily read by all systems. It is generally used in places where the exchange of information between two or more parties happens on paper. It could be used in cases where printed copies of invoices or orders are sent by a seller to a third party logistics provider for fulfilment. FIFO: First in, first out is a method of cost lot tracking where items are valued and sold in the order they were purchased. To better understand this, let’s use an example. Gerald buys 100 apples on Monday at $1 each and another 50 apples on Tuesday for $1.5 each. He sets his selling price at $3 per apple and sells 120 apples on Thursday. Now, according to FIFO, 100 apples out of 120 is taken from the older stock and has a value of $1 x 100 = $100 and the other 20 apples came from the next batch, valued at $1.5 x 20 = $30. Groupage: This is a method of grouping multiple shipments from different sellers (each with its own bill of lading) inside a single container. This is done when individual shipments are less than the container load or in other words are not big enough by themselves to fill up an entire container. This way, the freight cost is split between these sellers. HS: The Harmonized Set of Codes is a system of internationally accepted codes that help businesses and government bodies identify items while buying or selling them globally. These codes normally range from 4 to 10 digits, depending on where they are used. All the individual shipments have the same sender and receiver. It’s approved by shipping tariff authorities. IMDG codes: The International Maritime Dangerous Goods code was adopted under the 1960 SOLAS (Safety Of Life At Sea) convention. It provides guidelines for safe handling of flammable, explosive, corrosive or radioactive materials and helps prevent incidents of hazardous accidents and pollution that can occur during transportation of these goods. JIT: Just-in-time is an inventory optimization method where every batch of items arrives ”just in time” to fulfil the needs of the next stage, which could be either a shipment or a production cycle. Knocked Down: An item that is dismantled into two or more parts in order to facilitate easier transportation. These parts will then be put together before delivery. Landed Cost: The total cost of ownership of an item. This includes the cost price, shipping charges, custom duties, taxes and any other charges that were borne by the buyer. LIFO: Last in, first out is a method of cost lot tracking where your most recent purchases are sold first. It works exactly opposite to FIFO. PADAG: ”Please authorize my delivery against guarantee” is a document that mainly applies to consignments where a consignee is unable to produce relevant shipping documents (such as the bill of lading) to the shipper. The shipper instead receives a personal or bank guarantee from the consignee in exchange for releasing the goods in their custody. Waybill: A document prepared by the seller, on behalf of the carrier, that specifies the shipment’s point of origin, the details of the transacting parties (the buyer and seller), the route, and the destination address. Supply chain and logistics are a discipline so vast that it is better to take our time exploring it in parts. And to that end, we have focussed only upon those terms that we felt are helpful to SMBs. We will be looking at more supply chain concepts during the course of this year. So, if you have any requests or suggestions then please feel free to drop us an email at support@zoho-inventory.com or let us know your thoughts using the feedback options down below.